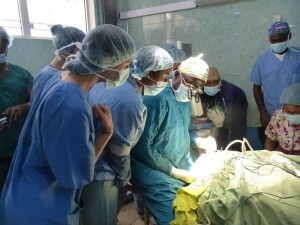 Today we continued our work at Korle Bu Teaching Hospital. We spent the morning working with a variety of patients, some of whom were returning to follow up with either the Speech Language Pathologist at Korle Bu or for continued evaluation from our students. We genuinely enjoyed learning from the wide range of patients and their families. We were able to assess and then provide recommendations for children with language delays, autism spectrum disorder, other intellectual disabilities, and even an adult voice patient. Throughout the morning, we worked on a rotation. At any given time about three quarters of us were working directly with the patients, while the other quarter was in the midst of experiencing a very special opportunity. Dr. Ampomah, the renowned cleft palate surgeon at Korle Bu, granted us permission to observe one of his cleft palate surgeries. We went in groups directly in the operating room, in scrubs, booties, head covers, masks and all. This was a learning experience that we would never have been so privileged to receive in the US and Dr. Ampomah was a wonderful and engaging teacher. As each new group of students went in, Dr. Ampomah oriented us to what stage of the surgery he was at and what we were seeing anatomically. It was extraordinary to be able to look inside the mouth of a patient undergoing cleft palate surgery, watch each suture being threaded, and listen to Dr. Ampomah explaining his surgical strategies. As we observed the surgery and later discussed it amongst ourselves, some aspects that stood out included the suturing of the bifid uvula, the levator veli palatini, soft palate, hard palate, and both layers of mucosa. It was increasingly evident to our whole group just how applicable and useful this experience would be in our work with any future patients with cleft palate and how it could contribute to our development of clinical experience and judgment. Additionally, we all felt that this would greatly contribute to our understanding of our patients from a more global perspective and we really saw the value of cooperating on a multidisciplinary team.